Just a quick update on the probability of unemployed Americans finding a job, ahead of our next quarterly economic and revenue forecast release on Thursday. According to the latest data from BLS, these transition probabilities really have improved quite a bit in the past year. Even surprisingly so, given that much of the headline data flows suggest a continuation of the slow growth recovery seen to date. Gains are seen even among the long-term unemployed as well. However, as Conor Sen detailed the other day, a lot of progress is being made below the surface in terms of slack and the like. Should this progress continue, eventually it should show up in higher real wages (we think), although we’re not quite there yet. Do read Mr. Sen’s work for a good summary of the stronger improvements seen in the past year or two. While there remains those two economic narratives out there that progress is being made in aggregate but not for the typical worker or household, examining some of these more recent data points suggest that fundamental improvements are being made. Top line numbers suggest the economy has fully regained its recessionary losses in terms of jobs, real personal income and the like, however, fundamentally the data suggest that we’re about 40-50 percent back in terms of the employment-population ratio for prime working age adults and items like these transition probabilities. The economy is not fully healthy, but the trajectory of these improvements is better today than at any point since the onset of the Great Recession and stronger than the conventional wisdom may have you believe. It’s been seven years next month since the onset of the Great Recession, but we’re starting to get there, we truly are. I think. Along similar lines, this is what our office has been discussing quite a bit this year in terms of the labor force dynamics. Stronger job growth here in Oregon has and is providing more opportunities for the unemployed. As the labor market begins to tighten, wages are picking up, at least back to housing boom era rates (which themselves were not the greatest) and we are now seeing the growth in the labor force. The combination of higher population growth, household formation, the Millennials aging into their prime working ages and those previously not looking for work rejoining the labor force, are reversing much of the losses seen in recent years, at least here in Oregon. Note that the percentages on the right indicate the share of recessionary losses regained as of October 2014. 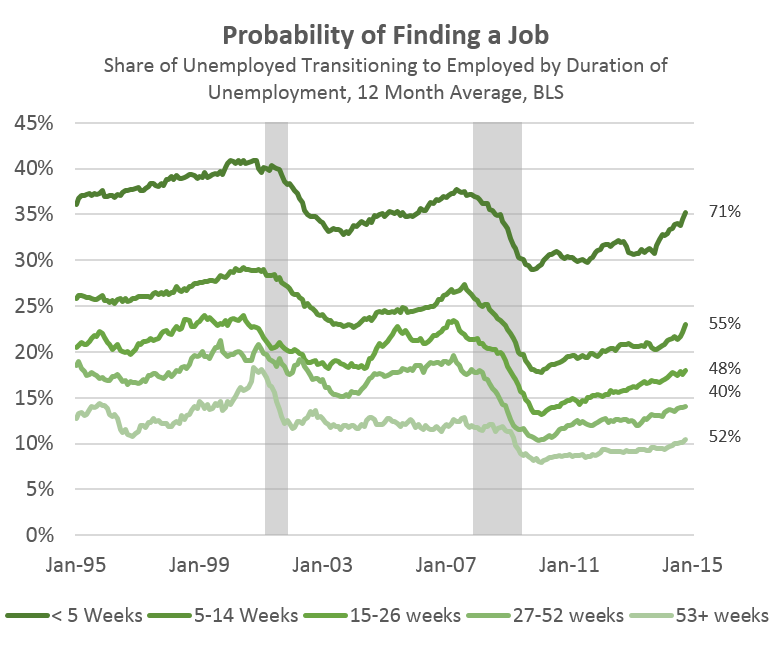 For example the transition probability for those unemployed 5 weeks or less peaked at 38 percent in May 2007 and fell to 29 percent in November 2009. Today’s rate of 35 percent is 71 percent of the way back from the bottom to the pre-recession peak rate.